“This card presents an image of self-examination. The answer to who we are can have multiple answers, and those answers may change with time and circumstances. We wear our various masks to falsely reflect or truthfully portray the myriad versions of what we are or can be. In this scene we see a reflection of our many selves. 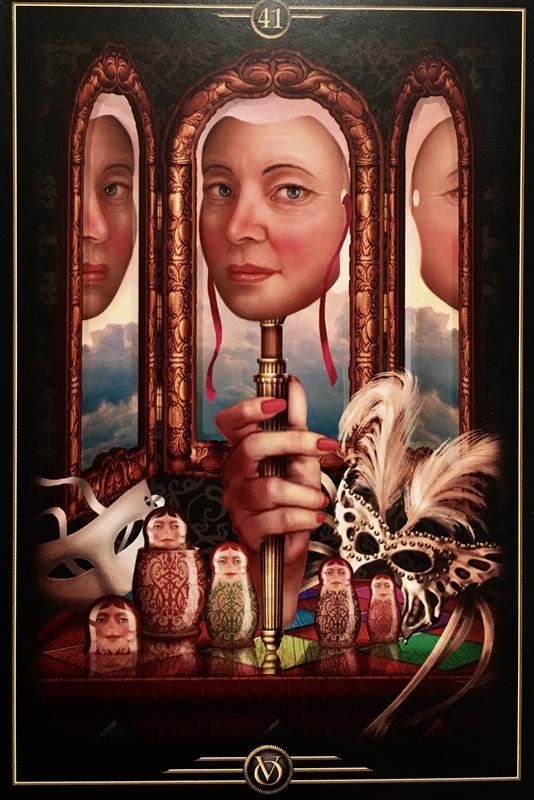 Like the Russian dolls below, we are personas within personas, any of which can be the prominent or visible facsimile we choose to outwardly project at any given moment. By deliberate choice or emotional reaction we reach out and choose from one of many masks. In this scene a plain and a flamboyant choice is available, but in truth there are so many others. Vulnerability is a beautiful thing. We strive to cover ourselves up; protect ourselves from others; stop ourselves from getting hurt. We believe that if we have suffered in the past, we will suffer in the future, so we must be vigilant in creating walls to shield us from pain. We wear masks to hide our true feelings, fearing that we may be judged or rejected for baring our hearts to the world. We suffer through toxic relationships believing that we are not worthy of something better; that the demons we know are far less scary than those we don’t know. We can even put on weight as an energetic shield; building cell upon cell to form a fortress around us. Yet if only we could instead, just shift our perspective. If only we could decide to trust that the Universe has our very Highest Good in mind. If only we could move forward fearlessly into new territory; opening our hearts to the love that is available to us. But all this requires that we remove the masks. We remove the energetic layers represented in the card as the Russian dolls. We allow others to see our true authentic selves; vulnerable and raw but real and pure. That is where the love is. It is not hidden behind a mask, it is not smothered by layers of protection. It is right here, all around us, just waiting to be received. Just waiting to be allowed to fill our hearts, replacing all fear. Today we look closely at ourselves. We identify the masks and gently remove them; they are no longer needed, that part of the journey is over. Yes it is a little scary but it is so very liberating. What do you really have to lose? And what do you have to gain by embracing every aspect of being you? Herein lies the answers you seek. I’m having a hard time believing this today. Recently most of my vulnerable moments I have allowed have been met with success. However, yesterday some used one of my vulnerable moments against me, in the most inconceivable way, someone I trusted. I feel deep grief and despair even while seeing the benefits of their actions and knowing it has nothing to do with me. My work is about helping others see their real selves and yet I sit here wondering what it is all for. Why is it so much work and so painful still? If I can’t understand it after years of Spiritual study how do I continue to help others? We teach what we need to learn but am I failing or a fraud? You’re a Clairvoyant, right 😘👍 lots of love and thank you. On point.